Did you watch the Royal Wedding? I did, and I loved every minute of it. 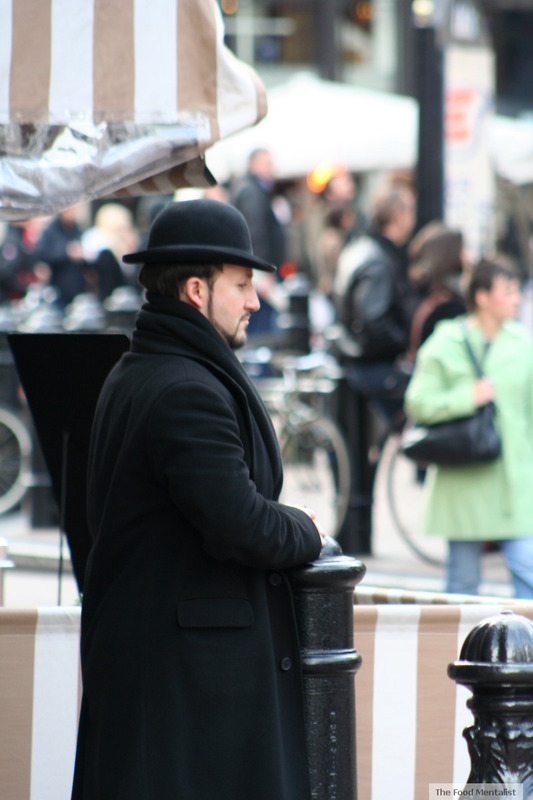 It reminded me of our honeymoon where we spent some time in London. 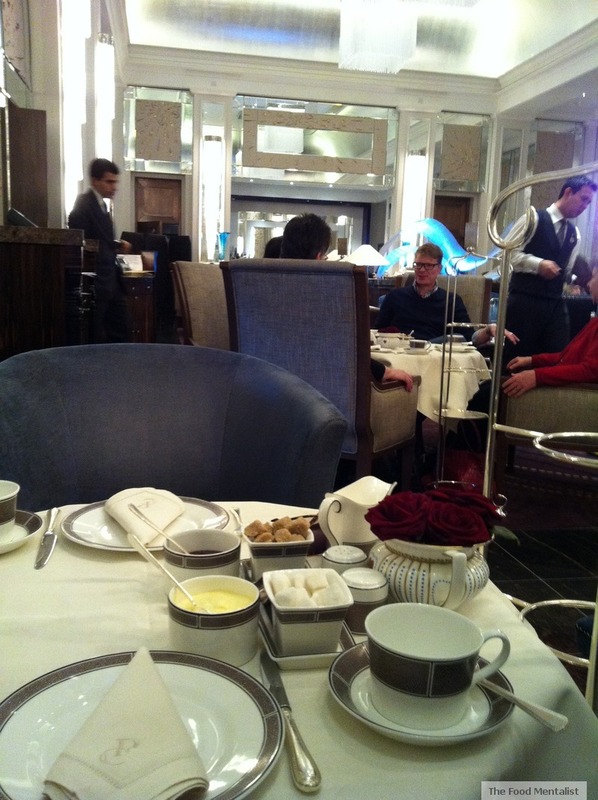 And in keeping with the theme of celebration I wanted to share with you all a snippet of our trip to London where we enjoyed a delightful afternoon tea at The Langham Hotel in London. Dating back to 1865, English Afternoon Tea is credited to the Duchess of Bedford. The legend says that the first lady to enjoy 'afternoon tea' was Anna Maria the 7th Duchess of Bedford who lived at Woburn Abbey in Bedfordshire and was a lady-in-waiting for Queen Victoria. 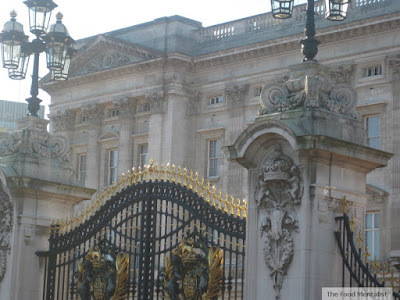 The Dutchess of Bedford is said to have experienced a 'sinking feeling' in the middle of the afternoon one day and asked her footman to deliver all the tea making equipment and some bread and butter to her private room. She found this new meal so satisfying and enjoyable that she soon started inviting her special friends to join her for 'afternoon tea'. Even when she went to stay with her aristocratic friends in their manor houses, she took her own kettle and tea making items with her so she could continue her afternoon tea parties when she was staying away from home. The simple platefuls of bread and butter that first accompanied afternoon tea developed into much more elaborate selections of sandwiches, scones, muffins, cakes, biscuits, gateaux and fruit desserts. 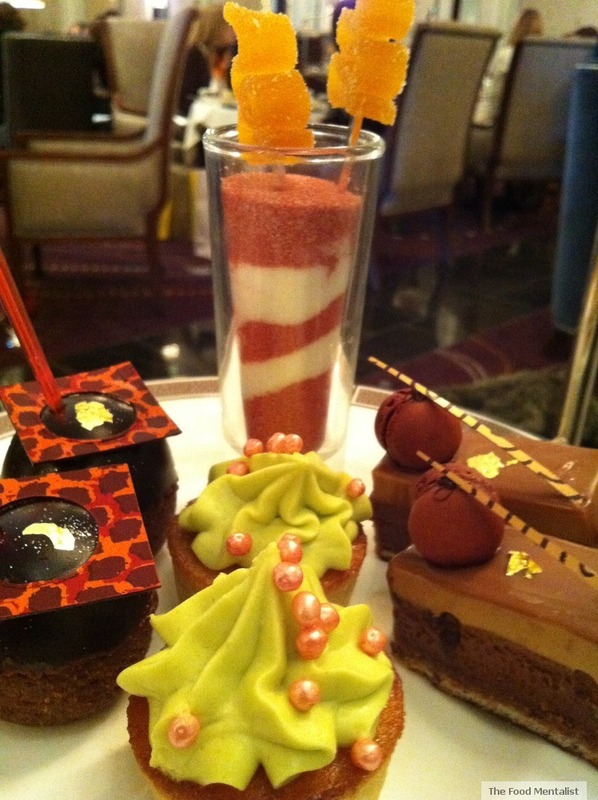 The centre piece of the five-star Langham, London hotel, the dazzling Palm Court is famed as the place where traditional afternoon tea was born over 140 years ago, an indulgence that lives on today. After watching Season 2 of Masterchef where the final few participated in an afternoon tea challenge at The Langham I knew it was a place we HAD to visit! Who could forget those gorgeous violet coloured macarons made by Callum? The Langham Hotel has hosted traditional Afternoon Tea at Palm Court, the centre piece of the hotel for over 140 years. The hotel itself is one of the 'Leading Hotels of the World' located in London's West End not far from the major shopping district of Regent, Bond and Oxford Streets. 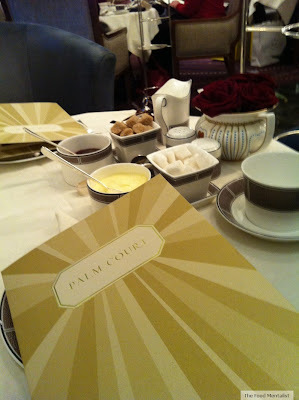 Palm Court offers a variety of choices for afternoon tea and after being seated we meet our host who gives us an afternoon tea menu and goes through the various choices available.We decide on the Wonderland Afternoon Tea served with a glass of Laurent-Perrier NV. Next, we are greeted by a tea sommelier who runs through the various teas available and offers us selections based on our tastes.The tea selection is extensive and includes several Langham Blends, Tregothnan Blends, Black Teas, Scented Black Teas, Green Teas, Scented Green Teas, White Tea, Puerh Tea, Yellow Tea, Oolong Tea, and Tisanes. Phew! Pete & I both select our tea from the Langham blends which have been created by master of tea Alex Probyn whose creations are said to be world famous. I choose the Jasmine Silver Needle with Rosebuds described as the finest Chinese Silver Needle white tea that has been dried with aromatic Jasmine flowers, combined with delicate pink whole Iranian rosebuds. Pete decides on The Langham - a sophisticated blend of second flush Indian Assam for a malty flavour, First Flush Indian Darjeeling: the 'champagne' of teas with delicate muscatel charm and Uva season High Grown Sri Lankan; for a light, citrus character. Our glass of bubbles arrives first and we clink glasses, it is afterall our honeymoon. 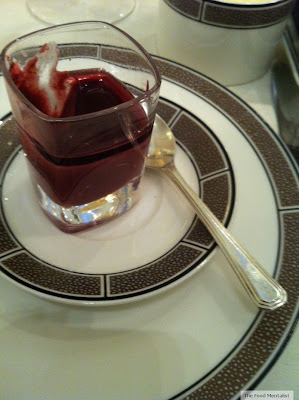 We are then given a little cup of Blackcurrent & Hibicus syllabub. The blackcurrent layer on top is rather tart and brings a nice balance to the rich creaminess of the hibiscus layer. Roast Castle of Mey beef with horseradish - this is my least favourite so Pete eats my share. Cucumber, cream cheese and chives - the sweetness of the cucumber on white bread is just so classic and the cream cheese and chives add a nice flavour. Poached Scottish salmon creme fraiche. All the sandwiches are fresh and flavours are well combined. My favourite would have to be a tie between the cucumber and the chicken & honey mustard sandwiches. Whilst we are enjoying the sandwiches a selection of hot scones arrive. YUM, I love scones! There are two sultana scones and two plain, served with a generous amount of clotted cream and strawberry preserve. During all the excitement and eating I forget to take pictures. We are barely through the scones and a selection of French pastries and gorgeous mini cakes arrive. All are absolutely delightful and I particularly like the pistachio cream icing on the mini cupcake. 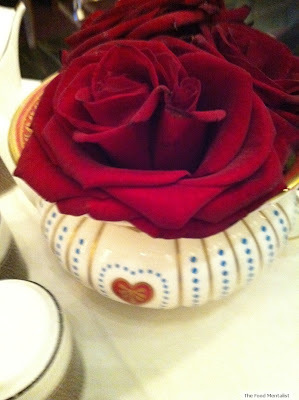 Our host continues to fill up our tea pots and we settle in and enjoy the sounds of the grand piano across the room. We are getting so full and are unable to finish all of our sweets, I know - this is a tragic moment! I decide that a long walk is needed so we head off toward Carnaby Street for a little more shopping, and we head out back into the cold. Oh how lovely! I didn't get to watch the wedding. We don't have our tv hooked up and also I was out at a dinner. 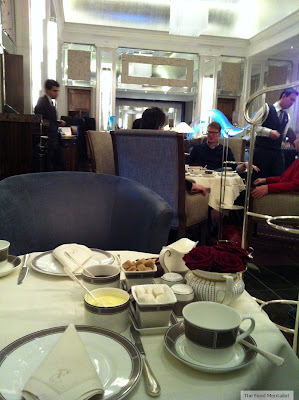 I saw pics though - gorgeous :) High Tea in London, how glorious! 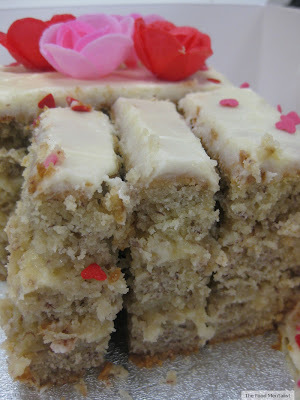 It's always the case with high teas that you don't get to finish all the sweets. What a bummer as they looked really delicious! PnD, so true!! It's a real shame all those yummy sweets are leftover. I was surprised re the afternoon vs high tea thing but it makes it sound very old world and rather charming by calling it afternoon tea. So nice.